The Sacrament of Reconciliation, also called Confession and Penance, is the sacrament by which we reconcile ourselves with God after we have sinned, and with a contrite heart, truly desire to be reunited fully with God. There are two ways in which we celebrate Reconciliation. In individual celebrations, you (the penitent) meet with a priest in private. In communal celebrations, the parish community gathers together to pray and listen to readings from the Bible. Then each penitent speaks privately with a priest. 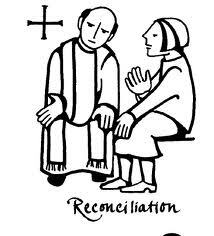 Individual celebrations of the Sacrament of Reconciliation are held every Saturday from 4:00 – 5:00 PM. Communal Penance Services are offered during the seasons of Lent and Advent. Dates and times during those seasons can be found in the Parish Bulletin and will also be posted under EVENTS. O my God, I am heartily sorry for having offended You. who are all-good and deserving of my love. to sin no more, and to avoid the near occasions of sin.